Because your child should enjoy the game while gaining confidence and to be able to find themselves as an athlete. The methodology behind the YDP is simple: We play, we practice, we play with an emphasis on what was learned in the practice. We learn and apply concepts in the same day, and this promotes accelerated growth within each of our players. 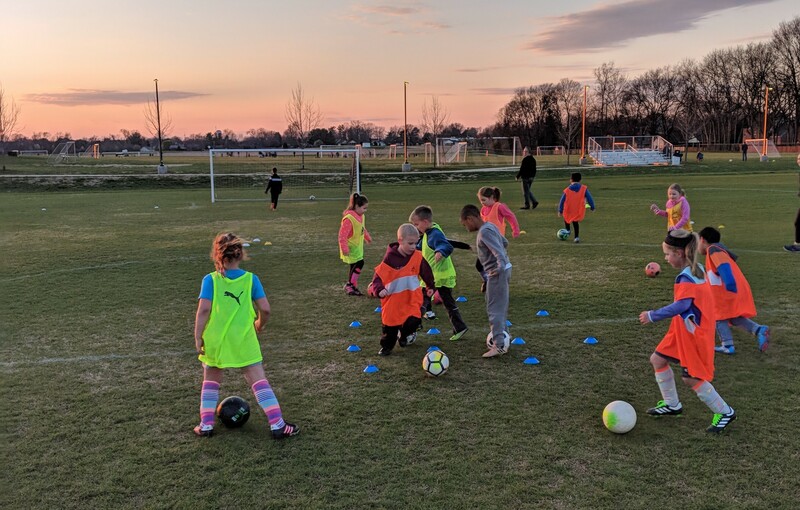 The YDP is a nonselect program where kids can play, have fun, learn valuable soccer traits. The YDP is a great feeder program into the SKY Academy, and will help create a great foundation of skill for the athlete to build quickly upon. The YDP is for both girls and of all abilities at the u7 and u8 age groups. This year, that means players born in 2011 or 2012 are elgible. The YDP will train twice a week on Monday and Thursday. The Saturday games are regularly scheduled at 9am with a couple of matches during the week. The Methodology behind the YDP is quite simple. Every training session will begin with a free play game. ALL of the YDP Participants will play as a single "pool" of players. When the players show up, they hop on a team and just simply PLAY. Very minimal coaching is involved, and the kids LOVE IT. The PRACTICE will always be in 2 phases. 1) The players will do 10-15 minutes of technical work, learning to manipulate the ball in many ways to avoid an opponent. 2) Players will take their newly learned skill and apply it to a game-like scenerio. They will understand the concepts quicker and the "little things" will forever help them along their soccer journey. This last PLAY Phase is where the kids jump back onto teams and play again. The coaches are trained to look for the skill that was learned at training and specifically praise that. Rec Saturday's for the YDP are similar to a typical Rec Saturday. YDP will play in the Co-ed u8 division, and games will be at 9am. Before the weekend games, the director of YDP will seperate the group of players into teams. This is a completely random process, so your team will change every week. The kids currently enrolled, love playing with different people every week. It's a great way to expand their social bubble and meet kids that go to different schools! We are commited to provide a safe and competitive environment for your child to play. We are commited to your child's continuous love and passion towards the beautiful game. We are committed to raising your child's confidence with the ball at their feet. We are committed to keeping the game FUN!